Another weekend and another Paris trip. Its too temptingly easy isn’t it when you can hop on a train early in the morning, have a snooze then wake up in Paris. Only problem with such an early start is the rumbly tummy you have by the time you arrive but then Paris is full of solutions to that particular predicament. 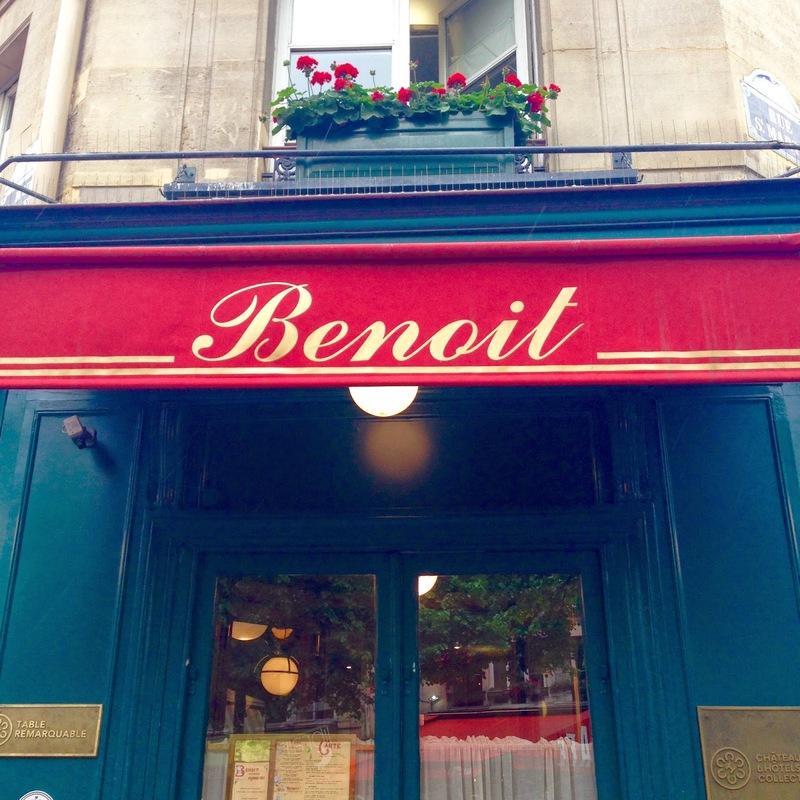 I had been intrigued by Benoit for a while so slipped a late lunch into the itinerary. Every Parisian lunch should begin with Champagne, there ought to be some kind of law in my opinion. This particular Champagne was Alain Ducasse’s house champagne. I have to admit that until the Champagne list I hadn’t realised the Ducasse connection with Benoit. He seems to have swooped in and rescued various ailing old French brasseries and stamped his mark on them, Benoit being one of them. Aux Lyonnais is another example of his extending Parisian empire. 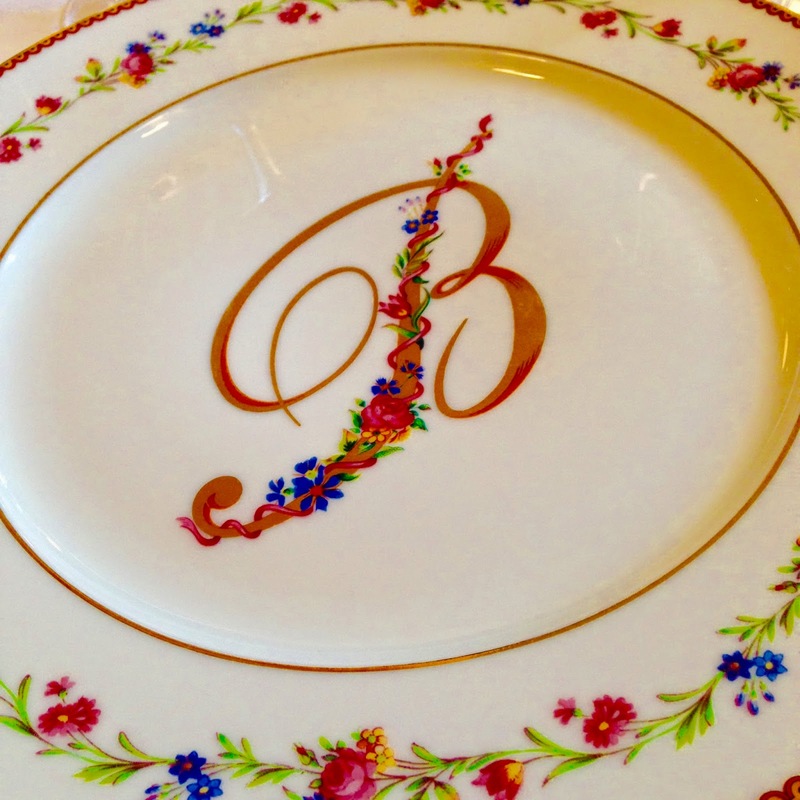 Benoit was apparently opened in 1912 by the Petit family and stayed in their hands until 2005 which is a pretty impressive feat. It was apparently originally frequented by the traders and artists of Les Halles before the market moved locations. I suspect it was rather more basic in those days though. I never fail to be utterly baffled by how Michelin awards its stars. Arguably, a massive pointer here is the fact that Benoit is owned by Alain Ducasse but surely Michelin wouldn’t be so fickle as to award a star just because of a link to a non-present chef? Well, the first chunk of my meal really left me wondering just that…. Judging by Parisian standards a three course lunch menu for 39 Euros seems like rather good value, especially when you get a choice of three options per course. When a plate of giant gougeres appears on the table it really seems like very little can be wrong with the world. 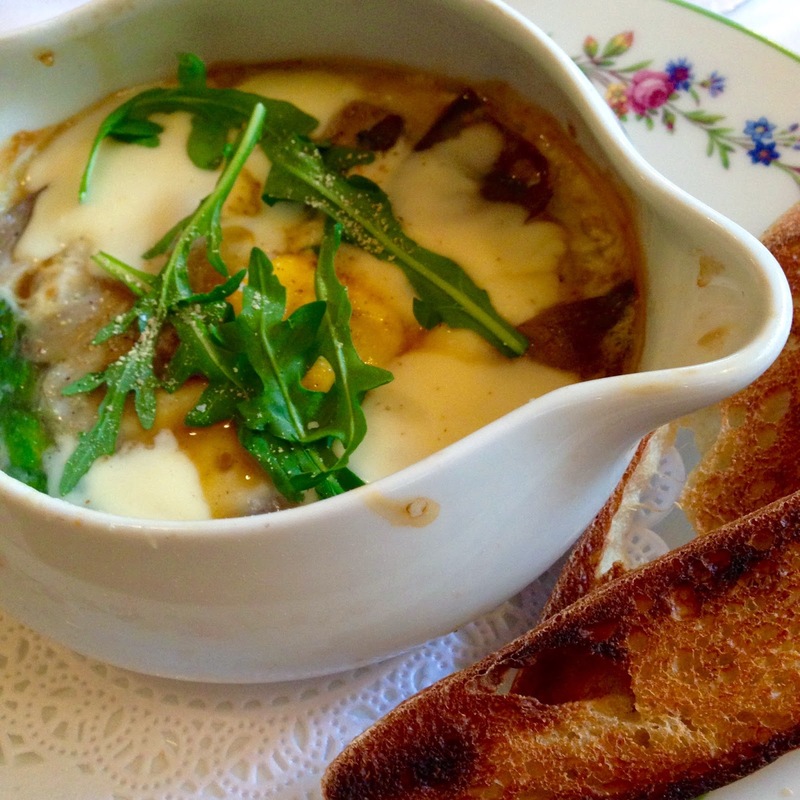 The starter of oeuf cocotte with asparagus seems like proper comfort food. Sounds delicious, after all who in their right mind doesn’t like the idea of dipping perfectly cooked new season asparagus into a thick, dippy egg yolk and seeing if you can make it to your mouth before it dribbles down your chin? Problem is that in this dish the asparagus is laid in the bottom of the gratin dish before the eggs and cream are poured on top. This results in stringy, hard to cut asparagus that has let out a pool of vegetable water causing the eggs to curdle into a weird hybrid of boiled and scrambled. Perhaps the first ever example of where a ‘deconstructed’ dish would have been an infinite improvement on the sum total. Onwards and upwards to a bavette of steak with shallots and a chard gratin. 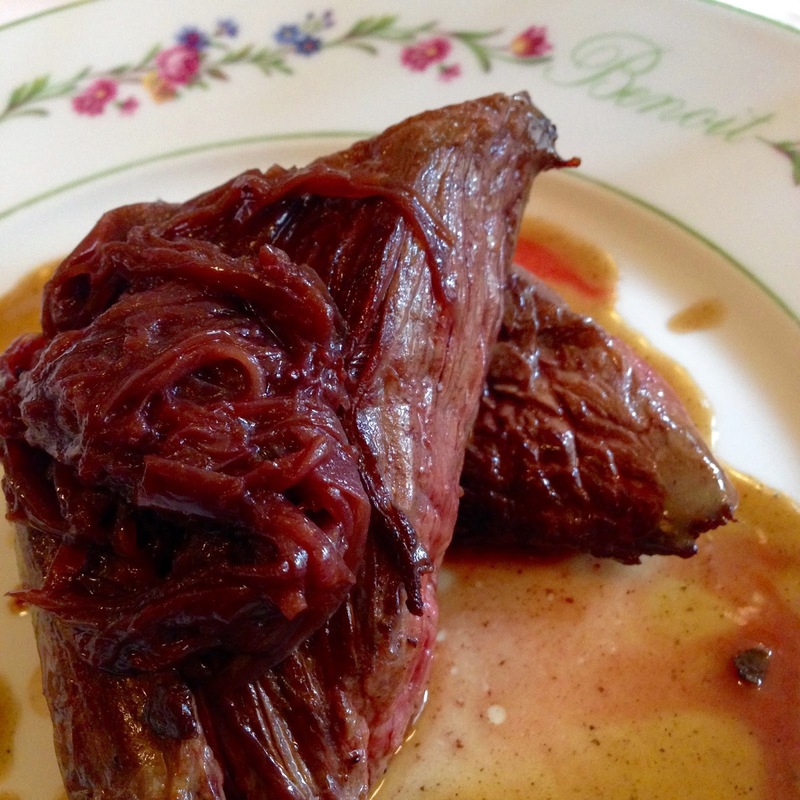 A bavette can always expect to be on the chewy side but flavoursome and this was perhaps a classic rendition of one. That’s all I’m going to say. 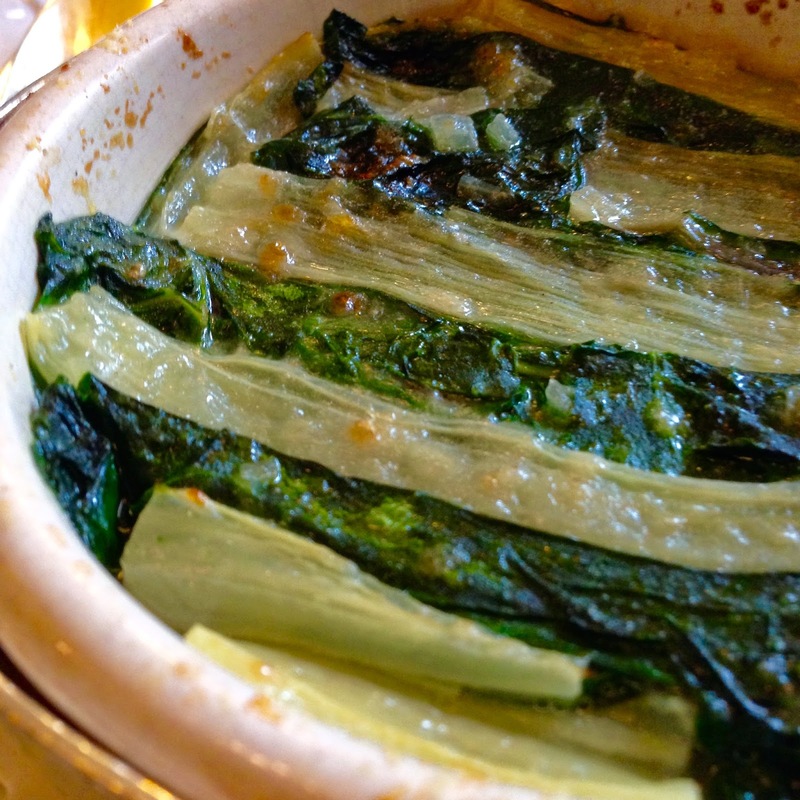 Either soggy gratins are a speciality of the chef or he hasn’t ever tasted his finished dishes as a dish of swiss chard was also swimming with vegetable liquid beneath a thin crust. Some chips or other potato based carb wouldn’t have gone amiss either. Just as I was beginning to despair at having wasted one of my precious Parisian meal outings, along came dessert: Savarin a l’Armagnac. Basically a slice of a giant version of a rhum baba but with brandy instead. Vanilla Chantilly cream was served in giant spoonfuls from a massive silver dairy pitcher. It was the stuff that dreams are made of but highly inappropriate fodder for lunch. A bottle of 1987 Delord Armagnac was popped on the table and left there. Its up to you how much Armagnac you add but need less to say I might* (*did) add quite a lot. I like to think that persuading the male half of a table of six octogenarians from Chicago into ordering it was perhaps my main achievement of the day. 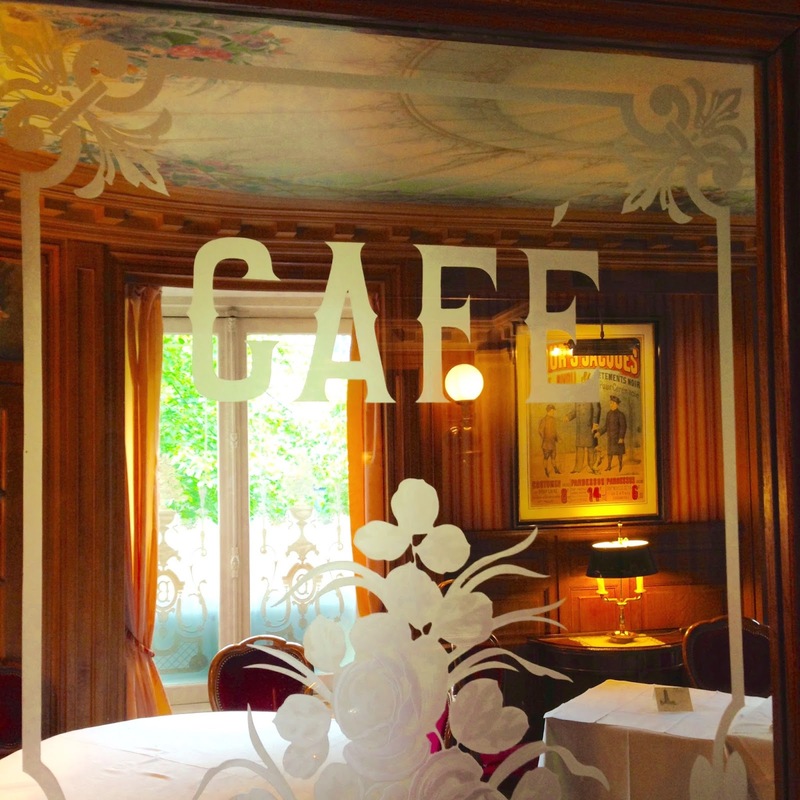 The twinkle in one chap’s eye as he leant in for the bottle for a second then third slosh of Armagnac made his wife’s thin-lipped, disapproving glare all worthwhile (she ordered sorbet – of course she did. No one in their right mind orders sorbet at dessert time in Paris, or anywhere else for that matter.) I fully expect that within an hour of leaving Benoit at least one of the party was taking a well deserved nap. Which is probably what I should have done rather than spend the afternoon trawling the kitchenware shops of Les Halles spending a small fortune on random gadgets I can probably live without but that’s another story….. 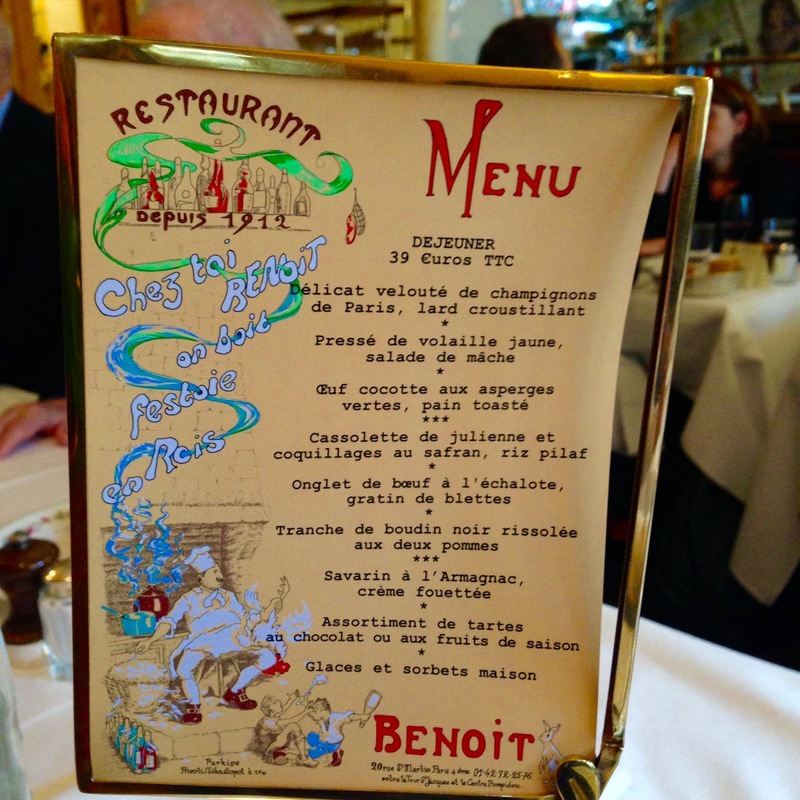 The lunch menu at Benoit is reasonable value (especially with the Euro exchange rate at the moment) but I think for a la carte there is much better food at a much better price in central Paris. Whilst most of it was all perfectly decent brasserie fare, only the savarin was particularly good and I wouldn’t have given a Michelin star to any of it. That said it is one of the few places open on a Sunday night which is something of a minor miracle in Paris so don’t rule it out altogether.